I guess it comes as no surprise to hear that the essentials of running a luxury hotel are something to do with exquisite catering, gorgeous interior design, and innovative technology. But did you know that those high-tech installations also include cutting-edge heating, ventilation and air conditioning? This is precisely the secret to the luxurious Crowne Plaza Copenhagen Towers Hotel having trimmed its CO2 footprint and the energy bill. Thanks to a groundbreaking heating and cooling system hidden in the basement, electricity consumption is now 60% lower than 4800 comparable hotels in the InterContinental Hotel Group (IHG). Due to this and other initiatives this hotel runs five times as efficiently as the IHG standard. And it’s won numerous international awards, including the most environmentally friendly hotel in the world. 90% energy savings thanks to smart HVAC alone? Yes. The ground water heating and cooling system installed here is known as Aquifer Thermal Energy Storage (ATES). ATES is an innovative open-loop geothermal technology, in use at over 1000 sites mainly in Scandinavia and the Netherlands as an energy-conserving measure for large buildings. It’s gaining popularity with good reason. 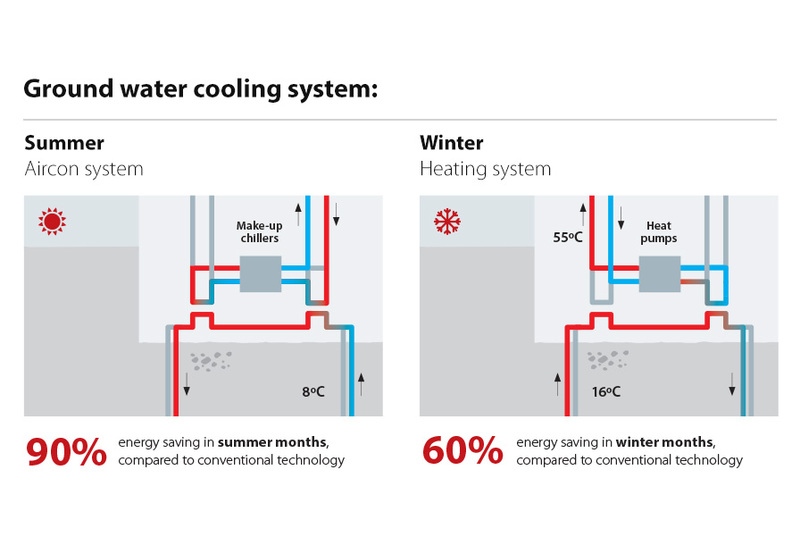 For a start, it can reduce the total energy consumption for cooling and heating of a building by approximately 70%; and more than 90% for cooling alone, compared to conventional technologies. The ATES system delivers a coefficient of performance (COP) of up to 40, which means that the cooling power is up to 40 times the electricity consumed by the installation. Normally the COP for a building of this size would be only 4 or 5. The Crowne Plaza ATES used a suitable natural ground water reservoir, known as an aquifer, into which two thermal wells were installed, for storage of heated and cold water respectively. This was achieved by two stages of drilling to a depth of 110 metres at two locations near the hotel. In the summer, cool water from the ground, at 7-9˚C, is pumped via one set of wells to the hotel basement, where it is sent through a heat exchanger removing heat from the hotel internal air-conditioning circuit. Then it’s pumped back down to a heat reservoir where the heat accumulates and is stored during the warmer months. In the air-conditioning circuit, water cooled in the heat exchanger circulates in the building to cool rooms to the desired temperature. This cooling system covers 90% of the total cooling demand with no active refrigeration. Two make-up combined heat-pumps/chillers guarantee sufficient cooling capacity in peak-load periods. This part of the process is what results in cooling power 40 times the electricity consumed by the installation – impressive savings given that it costs 6 times more to cool, than to warm water. Variable speed drives, on fans, pumps and compressors in the entire system play a crucial role in achieving such outstanding energy efficiency. In winter, water from the underground reservoir, which has accumulated heat during the summer period, is pumped through the heat exchanger and back down to the wells. In the heating circuit, water heated via the heat exchanger is sent through the two heat pumps which further raise the temperature to 55˚C. This heated water is then circulated to warm up hotel rooms and offices. Inside the building, AC drives ensure good control of the heat pump compressor. The two GEA Grenco heat pumps have a combined heat pump performance of 2,400 kW and are fitted with -controlled screw compressors, which enable the system to adjust the heat capacity continuously from low to full performance, with an optimum efficiency. VLT® drives also ensure good control of pump function for water circulation to and from the natural groundwater aquifer. All ground water pumps are controlled by AC drives in the form of VLT® HVAC Drive FC 102. Variable speed drives are also essential for significant savings and enhanced functionality for the pumps that propel heat around the hotel’s internal heating and air conditioning systems. 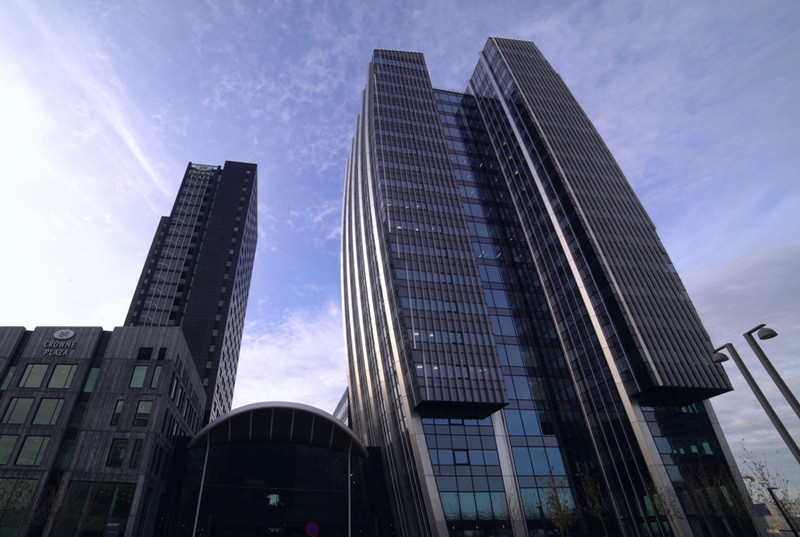 The ATES system has completely fulfilled expectations as the highly rewarding crown jewel of the Crowne Plaza Copenhagen Towers’ environmentally friendly smart HVAC system, and the savings have long ago repaid the initial investment. To learn more about the Crowne Plaza Copenhagen Towers installation, check out the video case story and brief or full iPaper . Aquifer Thermal Energy Storage has over a 90% savings potential. This is a perfect timing because I am in need of a new unit and winter is right around the corner. Thank you so much.